Sydney, AUSTRALIA: Paul Manera might not be a name many people have heard of but in the Australian gridiron community he is a household name. Manera is an alumnus of the University of Hawaii. He was the second Australian to ever receive a sch olarship to play American football at the college and played for the Rainbow Warriors from 1989 to 1991. In his senior year at Hawaii Manera was selected to the Western Athletic Conference as an Academic All-Conference Player and graduated with a Bachelors Degree in Business Administration with a Major in Finance. 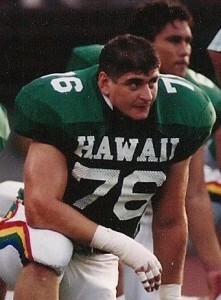 Manera began his coaching career in the Spring Semester of 1992 where he assisted with the Hawaiian Offensive Line. It was during this time that he realised his calling and returned to Australia to help the game that had given him so many opportunities. “I could have stayed in the USA and coached over there, there are friends that I coached with at Hawaii that are now Head Coaches or Coordinators in college who are enjoying great careers, but I realised that I could really make a difference by coaching in Australia and it really motivated me to come home”. In the 20+ years since hi s return to Australia, Paul Manera has coached at the Club, State, National, International and Professional level. Arguably, his biggest contribution to the sport would have to have commenced in 2008 when he and his wife, Elissa, started their sports business. Bring it on Sports specialises in teaching American Football in schools. Their Flag Gridiron program has sustained steady growth and in 2015 they taught over 400 sessions at schools in the Sydney Metropolitan Area. Now they are taking it a step further – Bring it on Sports, led by Manera, are running NFL Flag Camps during the April and September 2016 School Holidays. “Helping the game to grow down under has been really satisfying; the kids love playing Flag Gridiron and NFL Flag. It’s also a great way for them to try the sport without having to put on the pads so it’s a great opportunity for boys and girls all over Australia to experience America’s favourite game.” Manera says. NFL Flag School Holiday Camps will be held in Brisbane, Darwin, Sydney, Canberra, Melbourne, Hobart, Adelaide and Perth throughout 2016. 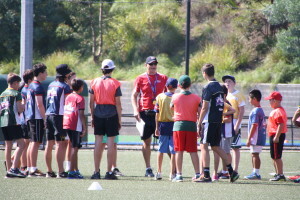 Bring it on Sports launched our first ever NFL Flag School Holiday Camp in Sydney, it was a great success and are looking forward to taking NFL Flag throughout Australia! Aussie Max Hendrie sign a Full Scholarship to play Football at the University Of Hawaii. We have just hosted the 1st ever Australian Outback National Women’s Training Camp who are getting ready to compete at the 2017 IFAF Women’s World Cup.. The Australian Outback Under 19’s National Team had their selection camp. Aussies Adam Gotsis (Georgia Tech ) and Blake Muir (Baylor) are eligible for the NFL Draft. The Australian Gridiron League Stage Competitions kicks off for both Mens and Womens Football. The University of Hawaii will be coming to Sydney to scout for talent Aussie players for scholarships. We will have some more players that we can send their way. The Australian Outback Junior Team travel to China in July for their first ever appearance at the IFAF Under 19’s World Cup. The Australian Outback Mens Team are travelling to Tahiti in July to play against Tahiti and American Samoa which will be their 1st ever meeting..
College Football comes to Sydney! The Hawaii Warriors and the California Golden Bears play at ANZ Stadium on the 27th. The first Australian NFL Flag Youth Competition will kick off in Sydney on Friday 14 October 2016. The National Gridiron League will be kicking off later this year.. It will be the 1st ever professional Gridiron League in Australia. For more information on any of the above please feel free to contact us. It’s is coming up to that time of the year again! SCHOOL HOLIDAYS! What better way to entertain the kids than with some Flag Football! Bring it on Sports are running an NFL Flag School Holiday Camp in the April & September 2016 for kids aged 6-17 years. Each participant will receive their very own NFL Flag Jersey! NFL FLAG comes to Australia! NFL FLAG COMES TO AUSTRALIA!!! Do you like playing football as much as watching games? Bring it on Sports are very excited and proud to announce that they are working with USA Football and the NFL to introduce NFL FLAG to Australia! NFL FLAG allows boys and girls, ages 5-17, play non-contact NFL FLAG football. The games are always fun and you’ll have lots of field-time during the non-stop action. Everyone gets to play in NFL FLAG and good sportsmanship and teamwork are always emphasized. Plus, you get to sharpen your football skills, learn new ones and – best of all – PLAY FOOTBALL!